What makes a good rock concert? You hope for charismatic performers, a band that puts all of its energy into the show, an enthusiastic audience. What makes a good concert movie? It ought to capture the energy of the performers. It ought to keep the movie audience engaged, even from the comfort of their home theaters. 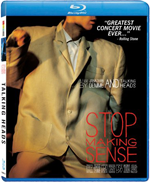 Stop Making Sense goes one step further and turns a concert into a cinematic experience. Shot over three nights in Hollywood in 1983, Stop Making Sense captures ’80s indie band Talking Heads at their prime. Front man David Byrne came up with the concept for the show, which gradually adds band members and visual elements to the stage. Director Jonathan Demme turned it into a movie. A 25th anniversary Blu-ray release features two great sound mixes and some bonus features that should please fans of the movie. Stop Making Sense starts with a bare stage and a microphone stand. Byrne comes out with a guitar and boombox and sings Psycho Killer. His sudden burst of spasmodic dancing is a sign of things to come. Next he’s joined by bassist Tina Weymouth for Heaven. A drum set is wheeled out next, along with drummer Chris Frantz for Thank You for Sending Me An Angel. Each song adds another band member and new visual elements, until there are nine them sharing the stage. The energy builds up to Burning Down the House, and just when I thought the show couldn’t get any more manic, the band moves onto Life During Wartime, which has Byrne and the backup singers doing aerobics. Things calm down a bit after that, with the band settling into a comfortable, high-energy groove. Byrne’s antics are at center stage. He’s bursting with tics and spasms when he’s not running around the stage. No wonder he’s so skinny. But Demme and company give all of the performers their close-ups, figuratively anyway. Actually, there are very few close-ups. The medium and wide shots, combined with long takes show the band performing as a band. Byrne may be the focal point, but his energy is matched by everyone else on the stage, and Demme makes sure the viewers know it. The one key element that seems to be missing from Stop Making Sense is the audience. Aside from a few shots at the end, its presence is confined to the side and rear speakers of our home theater. On the commentary track, Byrne points out that leaving the audience out has the effect of making movie viewers part of the audience. Indeed, at some early screenings of the film, audience members got up and danced. After 25 years, some of the clothing is a little out of date (OK, Byrne’s oversized suit was never in style), but the high-energy performances make the movie feel as fresh as if it had been filmed last year. Sit back and put yourself in the audience of Stop Making Sense, and don’t be afraid to dance if you feel like it. Most of the extra features were on the 1999 DVD release. The commentary track has all four band members and Demme, with each person recorded separately. Even though they all introduce themselves at the start, it’s hard to tell the male voices apart, though you can sometimes tell who is who from the context (when someone talks about filming techniques, it’s probably Demme). There are many long pauses, but most of what they have to say is interesting. Byrne has the most to say, and yes, he does talk about the giant suit (basically, it was just a costume). Also on this disc are three bonus songs, some promos for the movie, and a storyboard-to-film comparison. The new feature on the Blu-ray is a one-hour Q & A session with the band members that was conducted at the San Francisco Film Festival in 1999 (the movie had its world premiere at the festival in 1984). It doesn’t actually start until five minutes in. Some of what they say repeats the commentary. They also talk about the music business and share some stories about their touring days in the 1970s and ’80s. The picture is remastered and looks great. There are three audio options. The 5.1 feature mix puts more of the audience noise in the front and center channels. It sounds more like a rock concert. The 5.1 studio mix brings out the music and pushes the audience to the rear channels. Both sound great. Sample both mixes and stick with the one you prefer. The 2.0 mix would be best for headphone listeners. Watch the movie, then check out the shorter bonus features. Give the Q & A session a try, don’t be afraid to skip ahead if you find yourself losing interest. Save the commentary track for another viewing and be prepared to switch to one of the regular audio tracks when the pauses get too long.